During the opening speech at the 2012 ICTEV conference, the speaker Alan November briefly discussed the benefits of using Skype in classrooms. This made me realise that during my placements, I am yet to see teachers or students utilising this tool and it made me wonder why? Thus, I decided to find out how other educators use this tool in their classroom, with the aim of understanding how I could use Skype with my future students. After doing a little research, the benefits of using such a tool were obvious. 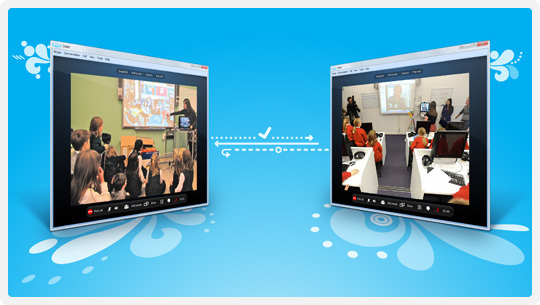 Skype allows for students to be connected to others while still being in their own classrooms. Students can meet meet other students, introduce overseas relatives to their peers, share their work with others, thus creating a global community. It is also an fantastic resource for teachers, as it allows you to interact with fellow educators, talk to experts, share ideas and create amazing learning experiences with others from around the world. The most important feature (I believe) is linking classes together, allowing for students to discover new cultures and undertake their learning together. Skype also allows for students who study online to connect to their teachers or gain access to resources which would otherwise be unavailable to them. An example of this is Teach The World Online (TWOL) who are currently establishing English language programs and curriculum to teach students in Haiti, Nepal, Cambodia,Colombia, Russia, Turkey, Tunisia, Pakistan & Brazil through using Skype. TWOL brings students around the world who want to learn English face-to-face with American university students who want teaching experience. Click here to read more. Also, Karl Prunell has written a very interesting blog about visual learning and skype, which I highly recommend. I could go on forever about this, and will write more about this topic in the future. Also, you can click here to view Alan Novembers Skype instructions for the classroom.